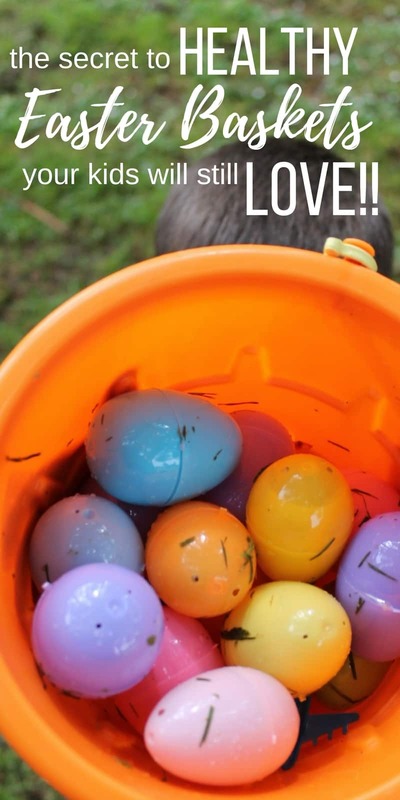 Home > Holidays > 2019 Easter Food & Craft Ideas > How to Make Healthy Easter Baskets Your Kids Will Still LOVE! Healthy Easter Baskets Don’t Have to be Boring! I know you love to see the look of delight on your kids’ faces as they check out what’s inside their Easter baskets. But deep down you worry about how much sugar they’re consuming because for kids Easter Sunday pretty much equals Chocolate Candy Fest right?? That’s why I thought you’d like to see these healthy Easter baskets alternatives that won’t end up with everyone in tears of disappointment! How much sugar is in that candy?? These small chocolate and peanut butter-shaped eggs are 170 calories and 10 grams of fat for just one piece. They are pretty small, and a lot of kids have more than one in their basket. Plus, it is loaded with 24 different ingredients (many of which you probably can’t pronounce) and 16 grams of sugar. The nutritional info might vary based on the type of bunny you get, especially when comparing solid versus hollow inside. However, the classic Dove chocolate bunny is a whopping 690 calories and 42 grams of fat for the entire one! It also contains 69 grams of sugar. marshmallow guys are pretty much just pure sugar. They don’t have any fat or saturated fat with a serving size of 5 Peeps, but there are 34 grams of sugar. Scarily the standard serving size of Cadbury Creme Eggs is two eggs, which makes sense since they often come in little boxes with two eggs inside. But makes no sense at all when you consider that in those two not so big eggs there are 300 calories and 12 grams of fat as well as 40 grams of sugar. Finally, you might pop a little bag of Brach’s (or other brand) jelly beans shaped like eggs into your child’s Easter basket. This brand has 450 calories in 3 servings (often what one bag or what fits in a plastic Easter egg). There is no fat or saturated fat, but an insanely high 90 grams of sugar! These are nothing but sugar. So what are the healthier Easter basket options then? Now I’ve scared you half to death thinking about all that fat and sugar let’s take a look at what healthy treats you can fill those Easter baskets with. Treats the kids will actually like of course! Never underestimate the power of non-treat gifts! You probably fill up the basket with mostly candy and maybe a small toy or two. Why not switch it around? Have just one small type of candy, then have little books, stickers, or small inexpensive items in the basket. It is still fun for them to open, but you don’t have to worry about hundreds of grams of sugar just in one Easter basket. If you like to fill plastic eggs with candy and put it in the Easter baskets, another option is to fill it with healthier snacks. You can fit your organic fruit snacks inside, nuts, seeds, or even small pieces of fruit that won’t spoil. You can also put little stickers or small toys in the eggs. Here are some ideas for Easter basket stuffers and egg fillers to inspire you! Don’t miss our Disney Easter Basket Ideas if your kids love Mickey Mouse or Princesses! If you want to give your kids chocolate, but in a healthier way, you can try making chocolate covered fruit. They are getting all the nutrition from the fruit you use and preventing them from having pure, solid chocolate at the same time. That little bit of chocolate covering banana slices or half of the strawberries really isn’t much as compared to that size of solid chocolate. Plus, you can use white chocolate and colour it orange or green for a festive collection. Instead of giving them little bags of jelly beans, why not get fruit snacks instead? Many of these also have a lot of sugar, so try to find the natural or organic varieties that don’t contain a lot of sugar or extra preservatives. and adults, but it is still yummy! You could also make your own delicious Easter treats to wrap up and pop in the Easter basket. These allergy free rice treats are also a great choice if your child wants to take treats to school. They’re gluten free, dairy free and nut free so all the kids will be able to enjoy them safely. Then watch the video to see how easy they are to put together! 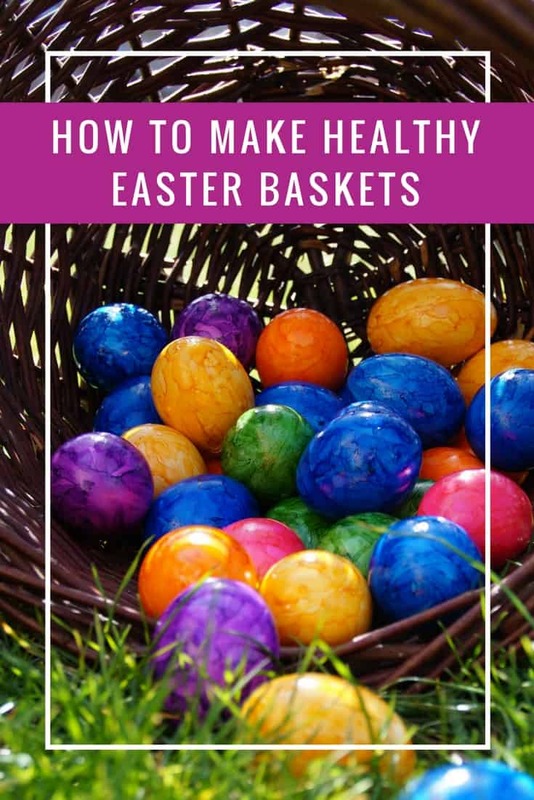 See it really isn’t that hard to create healthy Easter baskets that your children will still go CRAZY over – even when they’re not stuffed full of sugar! Previous PostPrevious Vacation for Free! 4 Ways to Gift Card Your Way to Disney! Next PostNext You Need to Try This! How to Find Time to Cook from Scratch AND Get Your Hair Done!